They have proven a fundamental truth: You can populate your play with profoundly interesting characters, give them things to do that impact every theatergoer’s psyche and bestow wonderful music for them to sing as they do it, but if the script doesn’t allow them to interact in a meaningful way, it’s just an exercise in futility. The playwrights prove this point despite the best efforts of a talented cast, who creates full-fledged and compelling characters. In fact, the cast and stellar set give us such high expectations that it makes the mind want to rebel at this idle script all the more. The premise seems like a winner: line up every presidential assassin or would-be presidential assassin in U.S. history and let them tell their stories. This group scarily argues all too persuasively that the American Dream cuts out many and that the only remedy is to kill a president. The playwrights even make a good initial effort to create a ringleader in the very charismatic John Wilkes Booth (Christiaan Smith-Kotlarek), who with one bullet provided a new way for malcontents to make history. But the fatal flaw in this play is Sondheim and Weidman provide little meaningful interaction between these very strong personalities, and the play ambles until it begins to feel like a high school reunion from hell. At this point, the playwrights could have made some tough choices. The play could have become a collection of monologues, with just one or two group numbers. The solo stage-time given to Sameul Byck (Leo Stagg), who wanted to kill Nixon, shows how this path could have had such promise. Many of these killers decide on their fatal course of action because they are so completely enveloped in their own worlds that their choices seem rational and inevitable. Stagg does such a great job letting us into Byck’s desperation and love-hate relationship with celebrity that we almost buy into the killer’s view of the world. Or the play could become a series of relationships between the assassins. It wouldn’t have been so agonizing to realize that this was a missed opportunity if the playwrights didn’t give such great stage time between Ford’s would-be assassins, Sara Jane Moore (Melissa Carter) and “Squeaky” Fromme” (Casey Tucker). The imagined interactions between these two are priceless, with the former acting out of a twisted “It’s-all-about-me” seventies ethos and the latter arguing she must kill because she believes she’s acting out the wishes of the Charles Manson. The two, a housewife and a hippie, first clash and then bond in a touching way, and Carter and Tucker both succeed best among the cast in making their characters criminally insane and at the same time sympathetic. But more often, the play devolves into something that’s a bit too clever to work. For example, there’s a strange undercurrent of two other MCs to the show, including a sometimes-joyous, sometimes-reluctant Lee Harvey Oswald (Evan Gambardella). An argument could be made this whole production is happening in Oswald’s head as he decides to kill JFK, but this is never made clear. Instead, he competes with a demented Uncle Sam and Booth to be the focus of attention, and the audience gets all sorts of confused. That being said, this play is good fun for history buffs and those whose tastes tend to the macabre. The cast commits to the flawed script and the music is easy on the ear. I just hope the Secret Service is taking notes instead of enjoying the local scenery in Latin America; if there’s one take-away from this play, it’s that it’s hard to stop the determined disenfranchised. 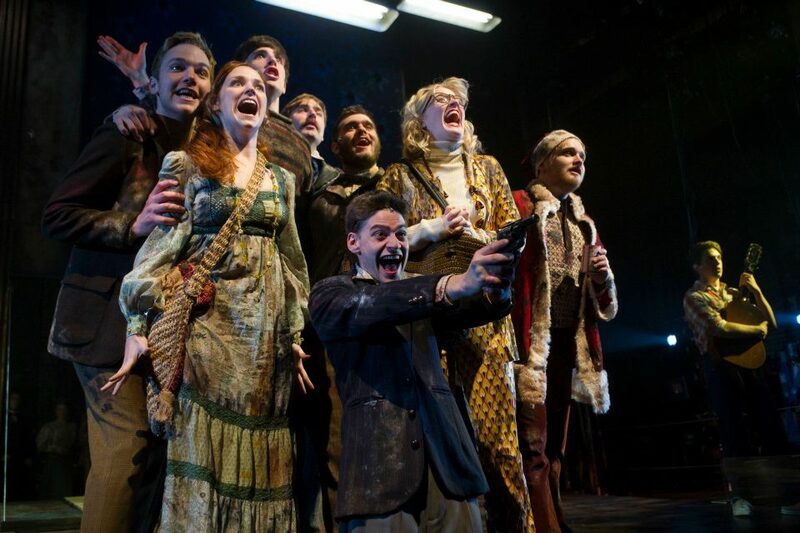 This entry was posted in Musicals and Opera and tagged 2012, American Dream, Assassins, Boston, Boston University Theatre, Casey Tucker, Charles Manson, Christiaan Smith-Kotlarek, Evan Gambardella, John Wilkes Booth, Lee Harvey Oswald, Leo Stagg, MA, May, Melissa Carter, presidents, Sameul Byck, Sara Jane Moore, Squeaky Fromme, Stephen Sondheim by craigidlebrook. Bookmark the permalink.